Gillom starred at Massillon, Ohio’s Washington High School under Head Coach Paul Brown and followed his coach to Ohio State in 1941, but left to go into the army during World War II. Gillom enrolled at Nevada after his discharge in 1946 and joined the Browns of the AAFC in ‘47, reuniting with Coach Brown. He backed up at end on both offense and defense and made his biggest mark as a punter. Gillom‘s high, booming kicks were noted for their hang time, and he lined up 15 yards behind center, rather than the 10 to 12 that was typical during that era, thus further helping the coverage unit. His average was 44.6 yards on 47 punts as a rookie and he had his best seasons for pass receiving in 1948, with 20 catches for 295 yards (14.8 avg.) and a TD and 23 for 359 yards (15.6 avg.) in ’49, the AAFC’s last year. In 1950, his first NFL season, Gillom punted 66 times for a 43.2-yard average. Browns went 11-1 to finish first in the NFL American Conference. Lost NFL Championship to Los Angeles Rams (24-17). Gillom led the NFL in punting again in 1952, averaging 45.7 yards, when he was also chosen for the Pro Bowl. 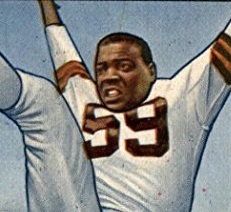 He spent a total of ten seasons with the Browns, until being waived in 1956, and averaged 43.1 yards on 492 punts. Of that, 107 punts for a 40.5-yard average were in the AAFC and 385 for a 43.8 average came in the NFL. He also caught a total of 74 passes for 1003 yards (14.6 avg.) and three touchdowns (AAFC: 45 for 678 yards and a TD, NFL: 29 for 405 yards and two scores).